NEW YORK (CNNfn) - You're sitting across the oak desk from the financial adviser who -- you hope -- is going to make you millions as you plan for your retirement. But how do you know you've chosen a trustworthy professional, and not a con artist who is going to take your money and run? Experts suggest you ask these five questions during that first face-to-face meeting with a planner. Getting the answers could save you time and headaches down the road. "Be prepared for the first meeting by bringing a list of questions," said Noel Maye of the Certified Financial Planner Board of Standards. "Do your homework, but understand yourself a little bit before you go describing yourself to a stranger." First, some experts suggest, you should conduct a five-minute phone interview with a CFP to break the ice and find out what the minimum investment amount is, who his or her typical clients are, and what types of paperwork you should bring to the first meeting. Question 1: What are your qualifications and experience? You're ready to start planning out your long-term goals and put your future� -- and loads of your money -- in a professional's hands. But what exactly does it mean when an adviser tacks those three little letters -- CFP -- after his or her name? "Of course they need to know if we're qualified and that comes out in several different ways," said Michael Smith, a certified financial planner in Atlanta. "We provide them with our resumes, a packet of information on our services." 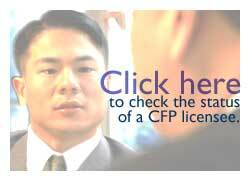 CFPs are licensed by the Certified Financial Planner Board of Standards and are members of the Financial Planning Association. They are required to pass a 10-hour exam, have at least three years experience as a planner or assistant to an adviser, agree to work under a code of ethics, and pay an annual $150 licensing fee, according to the CFP Board of Standards. CFPs must renew their licenses every two years and complete continuing education courses periodically. Question 2: What services do you offer? Before you even set foot into a planner's office, experts suggest you do some soul-searching and decide how you want your retirement years to look. Then the adviser can help you devise the best way to reach that goal. With that in mind, you'll need to know what types of services the planner offers -- whether it's tax planning, estate planning, insurance products or retirement planning. You should know that financial planners cannot sell insurance or securities products such as mutual funds or stocks without the proper licenses, or give investment advice unless registered with state or Federal authorities. Some planners offer financial planning advice on a range of topics, but do not sell financial products. Question 3: Will you be the only person working with me? As financial planning practices expand to meet growing demand, many employ assistants or para-planners, according to Maye. With that in mind, you should be aware of their backgrounds as well. "One of the things we're seeing in the profession now is that a lot of practices are growing from one-person firms," Maye said. So you need to decide if you're comfortable working with a variety of professionals. Ah, fees. Inquiring about how much is coming out of your pocket may be one of the most important questions in deciding whether the planner is right for you. a salary, paid by the company for which the planner works. fees, which can be based on an hourly rate, a flat rate, or on a percentage of your assets and/or income. commissions, paid by a third party from the products -- such as funds or insurance -- sold to you to carry out the financial planning recommendations. Question 5: May I have it in writing? Don't think you're being pushy by asking for a written agreement, many professionals agree. As the consumer, you have the right to get as much information you need to make a decision about hiring a planner, Maye said. So ask the planner to provide you with a written document that details the services to be provided. Keep this record in your files for future reference. And many CFPs say they work better with clients who have thought a great deal about retirement and what their goals are. "I don't want to work with someone who comes in and says, 'I want a 20 percent return,'" said Jill Hollander, a CFP with Financial Connections in Berkeley, Calif. "The ideal situation is someone who comes in with a list of questions and goals. We learn from each other." Get a ballpark estimate of what you'll need at retirement! Mutual fund facts from the ICI!